Free shipping available on all orders in the UK. Order before 2pm and select next day delivery to receive in 24hrs. Huge savings on all our waterproof products. 2 Year guarantee on all products as standard. The slim design and easy install Watervue TV with a cut-out dimensions of 984mm x 619mm x 61mm and the front only being 995mm x 630mm x 3mm which sits flush to your tiles. The WaterVue 43” Waterproof Bathroom mirror TV will bring entertainment to a whole new level, With A Full HD LG LED panel. With a fully treated glass front (not an acrylic front) and mist free technology, you will never need to wipe the glass whilst watching your favourite programs. All our Watervue bathroom TVs come with a 2-year warranty as standard with an option to add an extra year. With the European safety regulations, CE and RoHS approved and with an IP rating of 65 making the unit waterproof for bathroom environments. Comes with everything required to install into your bathroom. By purchasing this product you agree to our terms and conditions. Q: Why are bathroom televisions more expensive than normal TVs? Q: What are the differences between a WaterVue TV and a regular TV? WaterVue's HD-ready TVs are waterproof, keeping electronic components sealed from moisture and water. Electronic components in a regular TV can rust or become damaged if exposed to water or moisture in a bathroom. With a IPX rating of 65 our WaterVue TVs have the highest rating in the industry, allowing you and your family to stay safe. Q: Can I connect a Watervue TV like any other TV? All WaterVue TV’s connect exactly as you would a regular TV. The WaterVue TV can be connected to DVR, DVD, and other devices. Q. Are the speakers waterproof? Yes. All WaterVue speakers are located internally in the product and are sealed to keep them waterproof. Q: Is the remote control waterproof? With an IP68, it can withstand long periods of immersion under pressure/water. The WaterVue Remote Control allows you to control the TV. Q: Is the external surface of TV rustproof? Yes. 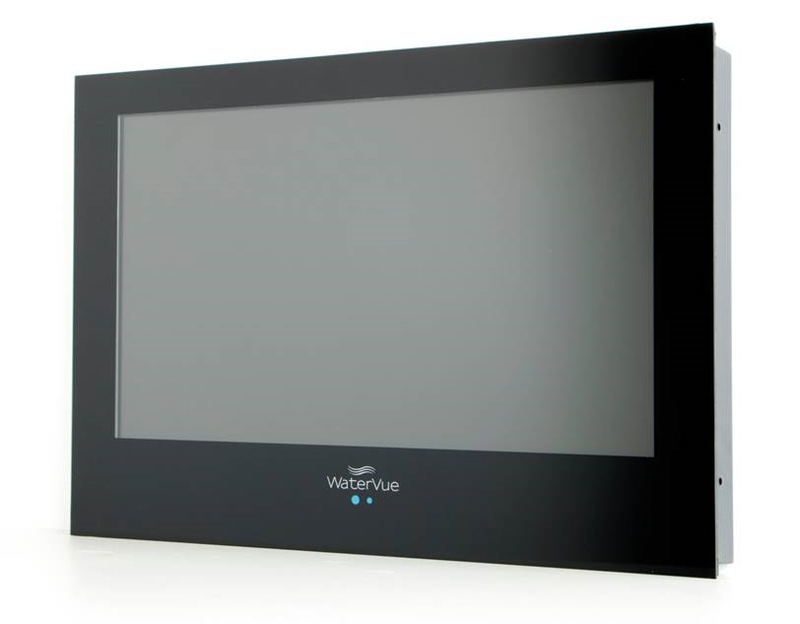 WaterVue TVs are powder-coated; enabling the TV to be rustproof and therefore resistant to water, steam and moisture. Q: Does every WaterVue TV come with everything I will need for installation? Yes, set up has never been this simple! All WaterVue TVs come with everything you will need for assembly including the wall box. Q. Can I connect external speakers? Yes, all WaterVue TVs come standard with audio outputs that allow you to connect extra speakers or use your current home surround sound as an alternative to the supplied speakers. All WaterVue TVs also come with built-in speakers as standard. Q: Can the TV screen fog? The heat of the TV permeates through the front of the screen, making the WaterVue TV completely fog-free. You can keep the TV viewing area crystal clear by switching on the TV a few minutes before use. Q: What will happen if my TV stops working? In the unlikely event of your TV stops working, you should either phone or email one of the team to report it. From here, our team will attempt to trouble shoot the problem over the phone, the vast majority of issues can be resolved over the phone. However if it is a problem with the TV unit itself we will replace your current unit with a brand new unit within 72 hours. Q: What is a Google Chromecast? A Google Chromecast is a dongle witch you plug into you HDMI port and power through the USB port, The Cromecast allows you to stream certain apps from your smart device to your Bathroom television. Q: What is an amazon fire stick? The amazon fire stick connects to your tv through the HDMI port and powered through the USB port of the bathroomtv. It is an easy way of watching over 4000 channels, apps and games including access to over 250,000 tv episodes and movies on Netflix, amazon video and many more apps, also allowing you to watch live tv without having an Ariel plugged into your tv. Why buy your bathroom TV from Bathroom TV Store? Bathroom TV Store is a British company, run by the same people who started it in 2009. Our WaterVue Bathroom TVs offer great value for money, with models usually found in the luxury-end of the market at affordable prices. We understand here at Bathroom TV that committing to an online purchase can be quite daunting without seeing the product. This is why we offer our 14 day moneyback guarantee which allows you to return if your TV is faulty or damaged or you are just not 100 % satisfied with your purchase. Your safety is of greatest importance. Our WaterVue televisions are built to the latest European regulations in Safety and Waterproofing, all with a minimum rating of IP65. All our bathroom TVs come with either 1 or 2-year warranty, with an option to extend to a further year. You will find that other businesses in our industry will only offer one year but we really are confident in the quality of our product and this is why we offer a 2 year warranty. Order before 2pm for our next day delivery guarantee.